Anyone who has ever worked with me knows that I am a big fan of virtual offices and telecommuting. I really do believe that many jobs can be done from anywhere. One of the biggest challenges to doing this is being able to effectively work on tasks that have historically always required people to be in the same room to be properly executed. Today’s post contains a few tips and tricks to being able to work as if you are sitting next to those you are working with regardless of your geography. Many people know about Google and their Google Docs product. In a nutshell, these are lite versions of Microsoft’s Word, Excel, PowerPoint and other useful programs that are cloud applications stored centrally on Google’s servers. One feature that people may not e familiar with is that you can actually share these documents and edit them in tandem with your fellow collaborators. This is pretty handy when you need to have multiple people doing different things on the same document at the same time. What’s more is that you can actually watch those edits happening and use the instant messenger on the right hand side to chat with them if you are not on the phone. I use this a lot in the Documents and Spreadsheets when I work with others. 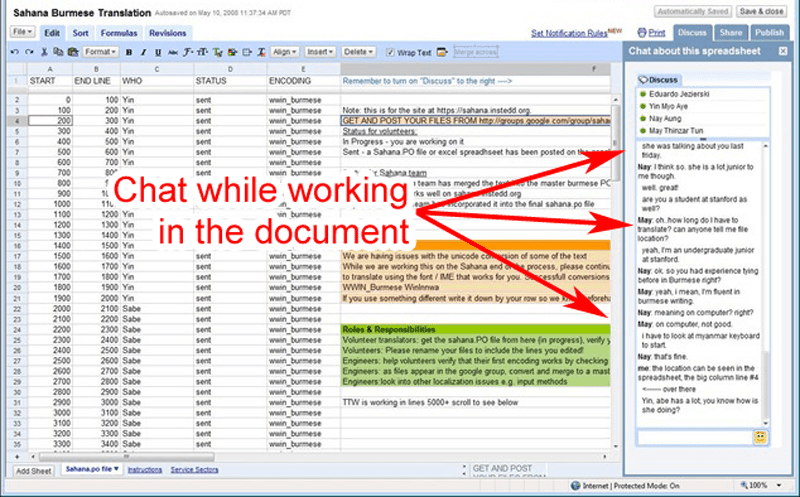 This is a huge time saver as opposed to emailing a document around from one person to another or having to combine them when all of the edits come in from the members of your team. I have done this in Word and it’s not nearly as easy as they would have you believe. 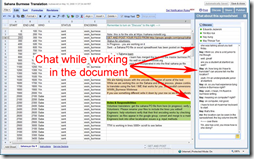 This way, you can track the changes, see who did what and, if necessary, you can export the document and open it up in Word to give it more advanced formatting for finalization. 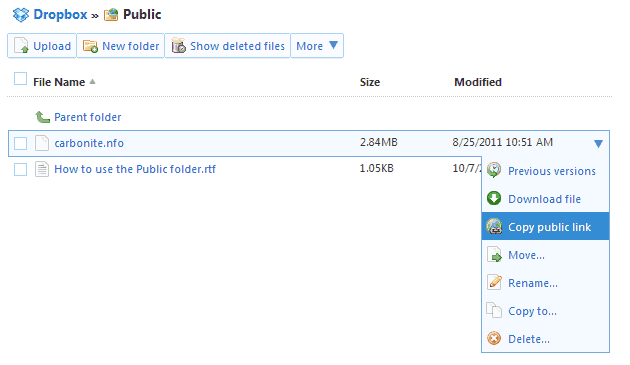 If you prefer to work in a local document and automatically share, many people like to use a shared folder in Dropbox. This is great if you have multiple documents that you all want t keep together in one folder and share that folder with your team (sort of like a group folder or junk drawer). Anything put in that folder will be copied to your team members’ respective computers. Alternatively, you can simply share a link to a single document that will only allow others to download the document. This tactic is great for sharing a document with any whom you send it’s specific link. You can also host files from your Dropbox shared folder for use with your website. This is useful if you want to update files regularly to your site without the use of FTP. Regardless of how you choose to use Dropbox, you can be sure that once you save your files, they will be updated and replicated everywhere. I can’t say enough good about this product. This tool is something that is probably not as widely known due to all of the alternative solutions out there but I think it’s one of the most clever, easy and (most importantly) light screen sharing solutions out there. Join.me is a very light program that you download and launch from your computer that will allow you to share your screen with anyone that has an internet browser on their computer. 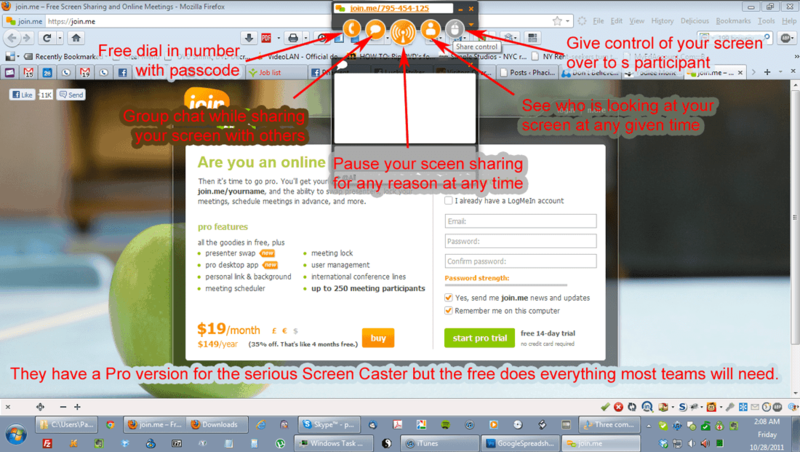 Those that view have to do nothing but plug in an access code. You can literally allow everyone viewing to see everything you are doing on your screen. This is excellent for training, demos, walkthroughs and reviews. This tool is unobtrusive, requires no installation, and does everything that it claims to do. This is great for a virtual team conference call where you need visual aids or have multiple presenters. You could probably get a superior solution to this but you will pay a substantial monthly subscription. Join.me’s Pro version is cheaper than the others that I have seen and will allow you to do even more such as host real webinars and get an international dial-in number. For the money, nether version can be beat. So there’s three commonly used tools and my tips on how to use them. 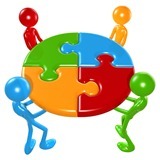 Do you have a tool that you use to collaborate with your team that you think is great? Please share it in the comments section. We would love to get your perspective. Useful tools, Patrick. I am new to join.me and am looking forward to trying it out.